Royal Palace Hotel, Guatemala City. 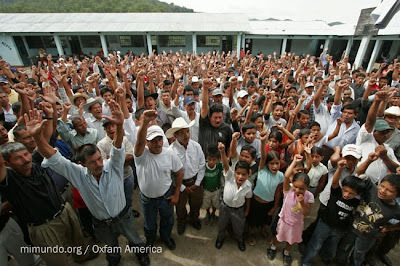 After a year in the making, Oxfam America will present in Guatemala the photo-publication Metal Mining in Central America: Pain and Resistance. The booklet features photography from MiMundo.org and the format is based on the same formula used to produce the photo-essays published in this website. The negative impact produced by metal mining at industrial levels in Guatemala, Honduras, El Salvador and Nicaragua, as well as the many types of local resistance which have sprouted in the region, are documented visually and supported by investigative text throughout the publications’ 72 full-color pages. Examples which expose the negative impact of metal mining focus on the fundamental issues regarding the use and contamination of water sources, deforestation, health, continuous poverty and lack of sustainable development in mining communities, as well as the social conflicts which almost always arise. The official presentation which will take place at the Royal Palace Hotel in Guatemala City (6a Avenida 12-66, Zona 1) on Wednesday, July 2nd, 2008, at 9 AM. Panelists will include Monsignor Alvaro Ramazzini, Bishop of San Marcos, as well as Rodolfo Pocop from the Indigenous Peasant National Coordination (CONIC). Bishop Ramazzini, a leading anti-mining activist in Guatemala, will speak about Mining Law Reform while Mr. Pocop will share his views on the relationship between the Mining Industry and Mayan Cosmovision. Following is a short preview of the content. Unfortunately, the publication is currently only available in Spanish but there will be an English version in the short future. 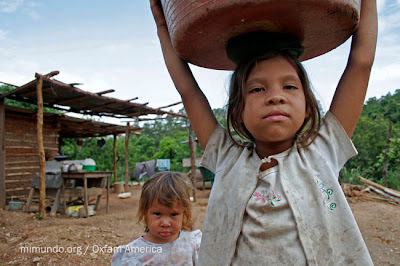 Locals struggle with extreme water shortages in San Isidro, Cabañas, El Salvador. Located in an arid region, the enormous El Dorado gold mine has been proposed to operate in this area and is set to consume thousands of gallons of water per hour. 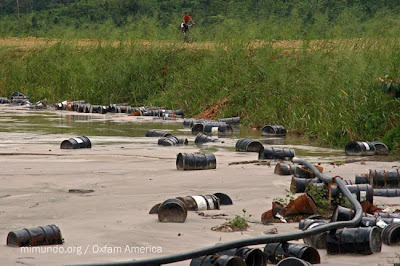 In the town of Bonanza, RAAN, Nicaragua, a young man rides his bicycle near the shore of a lagoon completely contaminated by mine residue and dozens of empty cyanide barrels. The highly toxic substance is heavily used in open-pit mines throughout Latin America by mining corporations mostly from US, Canadian and Australian capital. A family living in extreme poverty heads to laundry duties to be carried out in a local stream contaminated by the San Martin Mine in the town of El Porvenir, Valle de Siria, Honduras. The San Martin Mine has been highly controversial since it began operations at the beginning of the decade as more than fifty percent of the population from surrounding communities suffers from mysterious skin disorders as well as serious internal health issues due to the consumption of contaminated water. The mine belongs to Vancouver-based Goldcorp which also owns the also controversial Marlin Mine in San Marcos, Guatemala. Residents from Cajtavi Hamlet, in Nenton, Huehuetenango, Guatemala, unanimously reject the mining license granted by the Ministry of Energy and Mines within their territory during a landmark community consultation. Such local plebiscites have come to represent the people’s resistance to such imposed activities by international corporations and irresponsible local governments. Posted in: Latest News. Tags: gold, goldcorp, mining, oxfam america. hey James- congrats on all your hardwork on this photo book. Your tireless efforts are very inspirational to me. hope to see you somewhere again in the world. take care!